A remodel of a 1950s Cape Cod kitchen creates an informal and sunny space for the whole family. By relocating the window and making it a bay window, the work triangle flows better and more sunlight is captured. 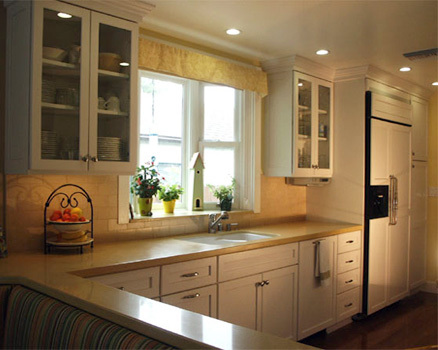 The white shaker style cabinets keep with the Cape Cod architectural style while making a crisp statement. The countertops are Caesarstone and the backsplash is natural limestone is a classic subway pattern. Above the cooktop is framed limestone in a herringbone pattern. The ceiling was raised to one level with recessed lighting directly above the countertops. A new bench seat for casual family dining takes up two feet from the kitchen and some of the family room. The small closet was converted to a desk area with easy access. New teak wood flooring was installed in the kitchen and family room for a cohesive and warm feeling.